8624 Colesville Road, Silver Spring. Located at Georgia and Colesville in the center of Downtown Silver Spring, fourth-place Sabroso Grill aims for a slightly more upscale Peruvian chicken experience than you'll find at its competitors. You'll still order food from the counter and watch a man with a large knife hack a chicken apart in front of you. But if you choose to eat inside, you'll get to do so in a surprisingly large dining room with mood lighting, soft music, and works "created by local, national & international artists." Sabroso's food doesn't disappoint, but it won't knock your socks off. Come in for lunch if you work nearby or grab a quick dinner before a show at the AFI Silver Theatre, but if you prize food over ambiance, head to El Pollo Rico instead. Meat and Flavor. The chicken is decent. There could be more flavor and the meat could have been juicier. I'm willing to chalk it up to a bad day because I was impressed by the friendly staff and awesome decor. Part of me wonders if Sabroso Grill would be good for "introducing" your friends to pollo a la brasa before sending them to places where orders are taken solely in Spanish. Sides. You can pick any of the long list of the sides to accompany your chicken without paying extra, which is a big plus. The rice with cilantro was a pleasant surprise, though I found the plantains bitter and crunchy. Sauces. It's the standard yellow sauce and green sauce. I found I emptied both packets way sooner than I have at other places. Multiple locations; we tried the one at Wheaton Plaza, 11160 Veirs Mill Road, Wheaton. Husband and wife Jorge and Carmen Perez opened the first Crisp and Juicy in Arlington twenty years ago and now have eight locations in the D.C. area, with five in Montgomery County alone. I visited their restaurant in Wheaton Plaza, tucked inside a parking garage next to the soon-to-reopen Hollywood East Cafe. Of the taste test Top Five, second-place Crisp and Juicy comes closest to a chain-restaurant experience. The servers are by far the most helpful. 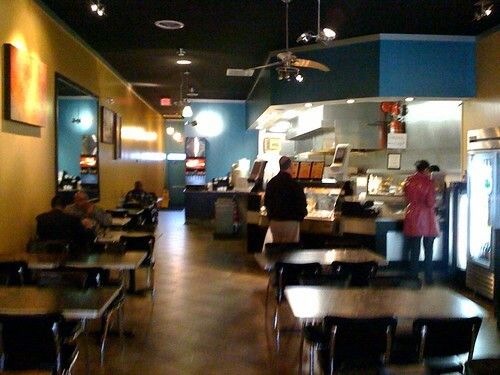 The dining areas are large, clean and brightly lit. And the food you'll get is predictable but not disappointing. Meat and Flavor. One word: cumin. Lots of it. The meat is nice and tender, but a little greasy. It's not as flavorful as a hole-in-the-wall like Inka's, but still far more interesting than Boston Market. Sides. 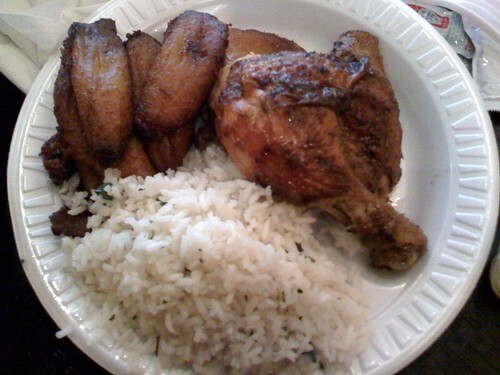 The rice was nice and buttery, but the plantains - one of several sides you can pick from without an extra charge - weren't amazing. They could have been overcooked. Sauces. Crisp and Juicy's known for their orange spicy sauce, served in place of the yellow sauce most places offer. The sauce is definitely a winner. Put your chicken in it. Put your plantains in it. Pour it on your rice. Ask for extra, take it home, and put it on your American food. You won't be sorry. Soon, we'll let you know how El Pollo Rico, our #1 pollo a la brasa stacks up - and, if I'm not completely tired of taste-testing Peruvian rotisserie, I'll tell you about two of my favorite places that didn't make the top five. If we're just talking about the chicken, then I would agree with you about Sabroso's food. The empanadas are excellent, though, and overall I Sabroso may be the best overall value of any restaurant in downtown Silver Spring. That orange sauce is from heaven. I haven't tried Sabroso yet but I think based on Casey's comment I will start with the empanadas! Agreed on Sabroso as most bang for your book - esp if you get a coupon in your clippers mag or inserts. Crisp & Juicy is the best chicken and dipping sauce though - man, I'm getting hungry. Just ate at Sardi's today, which was delicious as always and seems to be doing good business.